The Most Comprehensive Baby Chick Checklist Anywhere! Raising day-old baby chicks isn’t hard, and is delightful when everything turns out right. but doing it right involves a number of steps. You’ll have more success and fewer surprises if you use this handy checklist to stay on track. This checklist is adapted from my book, Success With Baby Chicks, available in paperback and as an eBook. Many items in the checklist refer to the individual chapters in the book that will give you lots of detailed information. I spent years learning all the tricks of the trade before writing this book. When I started, my results with baby chicks weren’t all that great, but now they are, and yours will be, too! If you don’t already have a brooder house, build one or adapt an existing structure. See Chapter 14. Clear away any brush or trash that may have accumulated around the brooder house. Examine the brooder house for leaks in the roof, gaps in the floor, and rat holes—and fix them. If there are signs of rodents, set out traps or bait now, so the rodents are gone before the baby chicks arrive. If there is an infestation of roost mites or other noxious bugs, treat the brooder house now. This is most likely if other poultry have been kept in the house recently. See Chapter 15. If there is old litter in the house, decide whether you are going to re-use it. If so, prepare it as described in Chapter 13. Otherwise, remove the old litter and put in new. Acquire or build a brooder, draft guard, baby chick feeders, and baby chick waterers. See Chapter 5. Remove any feed left over from last time. Day-old chicks need fresh feed! Unless the weather is hot, close up the brooder house by closing all the windows and covering any sizable openings with tarps, sheets of plastic, or plastic feed sacks. Don’t go nuts with this: we want to limit drafts, especially at floor level, but don’t try to make the house airtight. DANGER! If you are using vent-free propane brooders, it is possible for carbon monoxide to build up to lethal levels in a tightly closed brooder house. Install a carbon monoxide alarm if you’re going to use propane brooders in a non-drafty house. 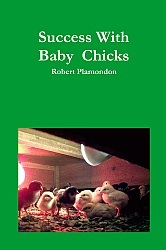 Select a source for your baby chicks: a good hatchery or feed store. See Chapter 3. Select a breed. Consider trying a new breed by placing an order that consists of your favorite breed plus one that might be a contender, so you can raise them together and see which one you like best. Sometimes you can become a lot happier with poultrykeeping just by switching to a breed that suits you better! Last time, did your feeders or waterers frequently go empty? Did your waterers cause you trouble? Was there feed spillage? Are you happy with your brooder? Is there mud in front of your brooder house? Do you have a conveniently placed trash can? Is the water supply to the brooder house convenient and reliable? Does the wiring to your brooder house make you nervous? Is your brooder house permeable to rodents, pets, or predators? Now, before the baby chicks arrive, is the time to make changes. Is it time to build a new brooding area? Do you have enough housing for the chicks after they leave the brooder house? Maybe it’s time to build a new chicken coop. Were your chicks too crowded last time? 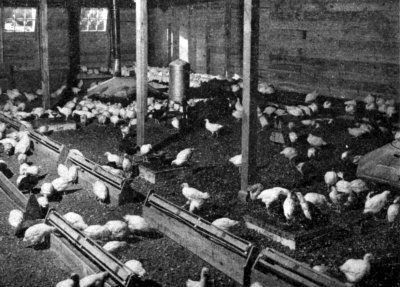 If they had high mortality, a wet house, caked litter, feather picking, cannibalism, coccidiosis, or more than one or two chicks that became runts that never grew right, they were probably too crowded. Consider brooding only half as many chicks this time. It’s amazing how powerful that one change can be. Write down the expected date of arrival and be sure a phone call from the post office will reach you. While you’re at it, write down the type of chicks ordered and the hatchery they were ordered from. If you’ve been considering more than one breed or more than one hatchery, it’s easy get lose track of what you really ordered before the chicks arrive! If this is the first batch of the season, turn on the brooder several days before the chicks are due to arrive to make sure it still works (often something unfortunate happens in storage, like corrosion). For later batches, start it at least 24 hours in advance. Buy fresh baby chick feed (chick starter). See Chapter 11. Buy or make feeders and waterers. See Chapters 11 and 12. Check the temperature under the brooder to make sure everything is okay. Do this enough in advance that you can do whatever it takes to keep from being chilled after they arrive. Put waterers just outside the brooder box. The floor under the brooder must be warm and dry to the touch before the chicks arrive. This is crucial! Install a draft guard, 10-18 inches high, around the brooder, with 2-3 feet of space between the edge of the brooder and the draft guard. Make sure there’s plenty of light for the chicks to see by. Baby chicks can’t eat or drink in the dark! Clean your quart-jar waterers and (if they are reusable) your first feeders. See Figure 1. While you’re at it, get the equipment that you will use only later into shape as well. Clean, inspect, and repair your automatic watering system (if any), feed troughs, tube feeders, “practice perches,” waterer stands, and other equipment that will be brought into use as the chicks get older. Double-check that your brooder is set up for day-old chicks, and has not been left the way it was the last time you used it, throttled back for older chicks who barely needed any heat. If you fetch the day-old chicks from the Post Office, run the heater in your car to keep them warm on the drive home if the weather is cool. If it’s warm, keep the chick box out of the sun. Baby chicks at the post office. Place the day-old chicks under the brooder without delay. Don’t leave the brooder house door open any more than absolutely necessary. 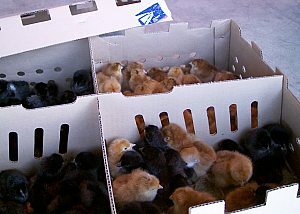 Commercial chicken farmers simply turn the chick boxes upside down to dump the chicks under the brooders. This doesn’t harm them, and gets them into the warmth with a minimum of delay. Give the chicks warm water to drink immediately in quart-jar waterers, with at least one waterer for every 25 chicks. One waterer per 15 chicks is better. After chilling, dehydration is your biggest worry. Give the chicks feed in the first feeders either immediately or after three hours (opinions vary). The 3-hour delay is intended to resolve dehydration issues before the issue becomes complicated by feed. First feeders can be egg flats (1 for every 50 chicks), plastic cafeteria trays (1 for every 50 chicks), or the lid or bottom of the box the chicks arrived in. The same brooding area after the arrival of the day-old chicks. 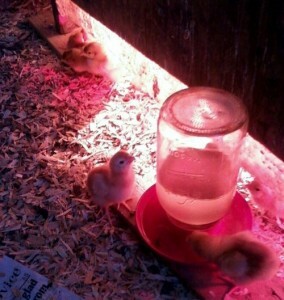 The chicks are already drinking from the quart-jar waterers and eating the chick feed in the box lids. Don’t let day-old chicks get chilled. Check on the baby chicks several times per day. Move any that get lost back into the heat. Make sure they are warm enough. Make a special trip at nightfall to make sure all the chicks make it back under the brooder. Also check first thing in the morning to make sure they’re warm enough. Spend time with the chicks. 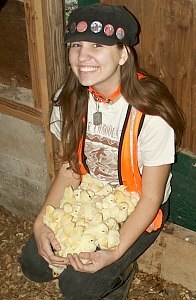 If you deal with the chicks hurriedly or mechanically, all the fun goes out of poultrykeeping. Also, when things start to go wrong, you won’t notice. Take a few extra minutes each time you’re in the brooder house. Leave the lights on all night so the chicks can see to eat and drink. It’s not time to put them on a day/night cycle yet. Refill the waterers and feeders as necessary. The chicks will kick feed out of the first feeders, and it will be lost. Don’t try to prevent this. Each time you visit the brooder house, check under the brooder for sick or dead chicks. Dead chicks need to be removed immediately. Some first-week mortality is normal. The amount of it depends on the amount of stress the chicks underwent during shipping and the amount of stress in the brooder house. The highest mortality will almost always be in the first 48 hours. It should cease, or almost cease, after that. Check on the baby chicks at least twice per day. Take your time. Keep in mind that chickens are easily stressed by sudden changes in routine, so make your changes gradually. Expand the draft guard to give the chicks more space and to make room for more equipment. Add larger feeders, either chick troughs or small (15 lb.) hanging tube feeders. Tube feeders should start with their feed pans flat on the ground. Troughs should be filled to the top. 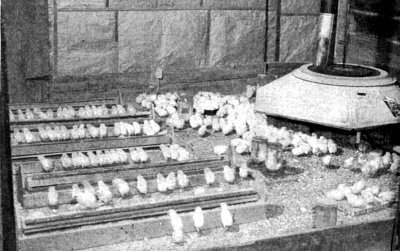 Use eight feet of chick trough per 100 chicks (two 4-foot troughs, four two-foot troughs, or eight one-foot troughs), arranged so the chicks can feed from both sides, or two tube feeder for every 100 chicks. Keep using the first feeders. Add larger waterers, either chick founts (which come in 1-, 3-, and 5-gallon sizes, 1 gallon per 50 chicks) or automatic waterers. These should be on stands that keep them above the floor and prevent litter from getting in the water. 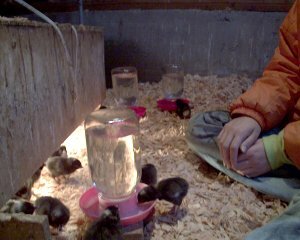 The waterers should be adjusted so the chicks have to stretch a little to get the water. This will prevent them from splashing in it and getting chilled. See Chapter 12. Don’t remove any of the quart-jar waterers yet. Discontinue all-night lights after three nights. Day 3: Chick troughs have been added and the brooder guard has been removed. Box feeders are still used. Expand the draft guard again on Day 5. If the chicks are getting past it, or the house is so small that practically all of it is inside the draft guard already, remove it. 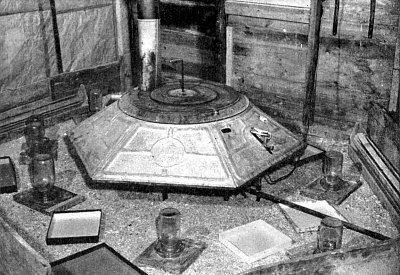 Remove the quart-jar waterers gradually, one or two per day, until only the large-capacity or automatic waterers remain. Keep an eye on the chicks; sometimes it takes longer for them to use the big waterers, and you’ll have to hold off removing the small ones. Remove the first feeders gradually, one or two per day, until only the trough or tube feeders remain. If tube feeders are used, check their height each day, adjusting them so the chicks are neither straining up nor reaching down to eat. If trough feeders are used, fill them a little less full day by day, because a full trough leads to a great deal of feed wastage. If overhead heat-lamp brooders are used, raise them a couple of inches higher at the end of the first week. 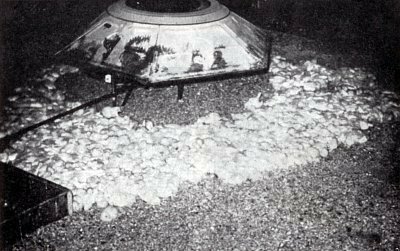 If insulated heat lamp brooders are used, reduce the wattage of the bulbs at the end of the first week if the chicks seem comfortable. 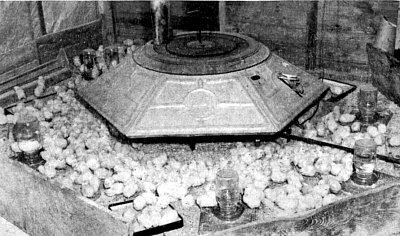 Turn down thermostatically controlled brooders by 5 degrees F.
By the end of the first week, mortality should have ceased altogether, even if the baby chicks were overheated or chilled during shipping. If not see Chapter 15. The same chicks during week 2. They have been given more space and larger waterers on wire stands. Double the amount of feeder space. If using trough feeders, it may be time to replace them with ones designed for larger chicks. This will reduce feed wastage. Continue increasing the height of the feeders as the chicks grow. Pay attention to litter quality. 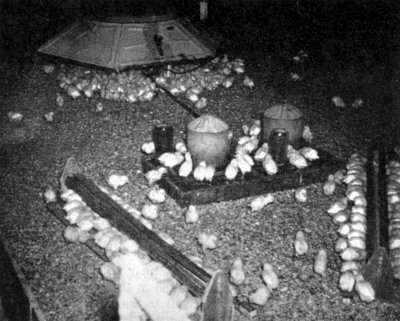 Caked litter tends to appear around the brooder at this time, and wet litter tends to appear around the waterers. Remove both as they appear. See Chapter 13. Start increasing ventilation a little at a time. At the end of the second week (Day 14), turn down the thermostat another five degrees, raise overhead infrared heaters two inches, or raise insulated heat-lamp brooders an inch or two—whichever is appropriate to your brooder. Except for broilers, add some “practice perches” to encourage early roosting. Turn the thermostat down or raise the brooder again, as appropriate. Keep checking the brooder house twice daily. It’s easy to fall out of the habit because this period is generally trouble-free. Chicks sleeping at night. Their heat needs have gone down, and the space under the brooder has become too warm for comfort, so they sleep just outside. These are the last weeks of the brooding period. Depending on the weather, broilers may not need brooder heat after two weeks, Leghorns after three, and other breeds after four. But be prepared to give brooder heat to broilers for three weeks and other breeds for five. Add an additional week if you are brooding in winter. As the chicks grow, they need a lot more space, and larger feeders. The chicks get quite large during this period, and a brooder house that was fine yesterday can be crowded today. Crowding can lead to sudden outbreaks of coccidiosis (a protozoan infection), feather-picking, and even cannibalism. It is very important to have enough floor space to keep the birds happy and healthy for the entire brooding period. This is easy if they are being brooded in the same house in which they will live throughout their lives, but if they are outgrowing the brooder house, they need to be moved on time. Delay can be disastrous. At the end of the brooding period, the feeders need to be swapped for larger ones that are suitable for adult birds, and (except for broilers) full-sized perches installed. For hens, nest boxes will be needed by Week 18 for commercial layers, or Week 20 for other breeds. Once heat is no longer needed, the chicks can be moved outdoors if you have a yard or free range for them. This checklist will help you all by itself, but for more detail on raising baby chicks, read my book, Success With Baby Chicks, available in paperback and Kindle editions. It covers everything here and much, much more, with all the detail you need to do things right. am a cameronian, a senior agriction technician( ongoing). i have a vision of poultry production with ever free from fat and motality… i need an assistant in rder to set up my poultry with a good market.